If you saw GWRRA’s Wing World magazine’s June, 2006 issue you might have seen a letter to the Workbench column about GL1000 timing belts. The writer kindly referenced me as a “well-known wizard on the GL1000” and mentioned my timing belt change interval recommendation. I doubt that I’m worthy of the credential bestowed upon me by the writer of that letter! In any case Stu Oltman, GWRRA’s Senior Technical Editor, took exception with my timing belt change interval advice. Stu is a very knowledgeable fellow and I have great respect for his expertise. He correctly points out that oil contamination and incorrect installation can shorten cam belt life considerably. In the separate article (same issue) on the ’75 restoration that he did for the GWRRA corporate office, he admits (page 43) that he doesn’t have much experience with the Gen I bikes. So, when he characterizes my 5 year / 25,000 miles service interval as “severe overkill,” I find that very interesting information and respectfully disagree. I stand by my recommendation based on my own experience. Unfortunately, cam belt failure is not an “extremely rare occurrence” as suggested. I have seen the carnage this can cause many times! My recommendation is for GL1000 models only. I defer to others on GL1100s, GL1200s and GL1500s. I suspect you can go a bit longer on the belts on the later models because they have lower redlines. The normal automobile recommendation for 4 cylinder cars is typically 5 years or 60,000 miles. I submit that the GL1000 engine puts more stress on it’s belts than a typical car does (via higher performance cams and much higher redline.) There is no definitive, non-contradictory recommendation from Honda regarding GL1000 cam belt interval. I’m quite happy with the conservative recommendation I make. In any case, belts are cheap compared to bent valves (and worse). Randakk’s also offers excellent replacement timing belts. Search in the ShopTalk area then select this thread by Octane in the Timing Belt section. I recommend free registration with the Naked GoldWings Forum to access the complete wealth of specialized information available via that site! This information is courtesy of Lars Nielsen, aka “Octane” – Denmark. Lars is an internationally famous GL1000 enthusiast and prominent technical contributor to: Naked GoldWings Forum Thanks Lars! Tip: contrary to most advice, it is not necessary to remove the the radiator and hoses when replacing the timing belts if you have access to this handy tool! Tip: always adjust final belt tension with the engine fully WARMED from 20 minute+ ride. Per above – always let the springs do the work…don’t “help” them any. Boxer engines “grow” due to thermal expansion and you will over-tighten cam belts, shorten their life and cause whine if you don’t accomodate these physics. 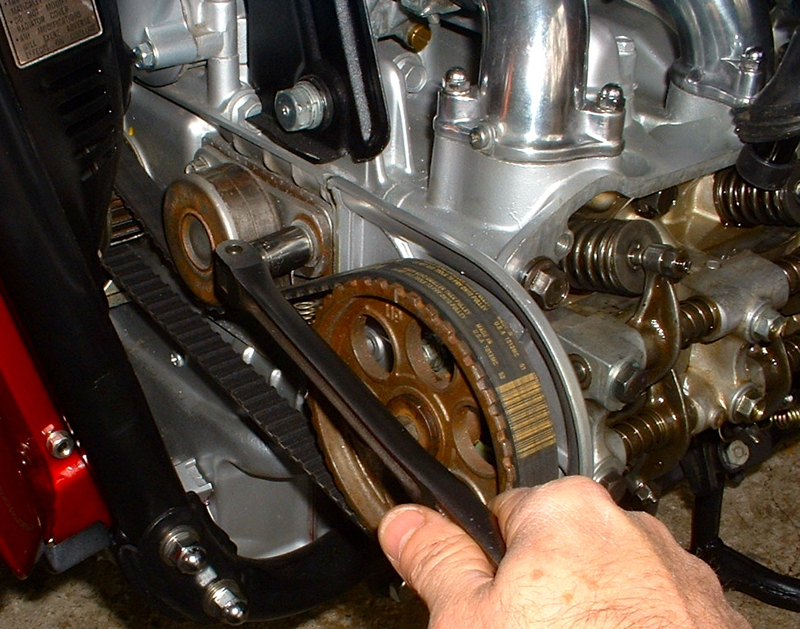 On a GL1000, incorrect belt tension will also corrupt ignition timing since the timing apparatus is driven off the left cam not the crank as in later engines. Thus, belt tension has to be perfect BEFORE you mess with ignition timing. In my experience, many timing belt tensioners are needlessly replaced to correct “whine” cause by improperly tensioned belts. Another Reason to Change your Oil! Thanks for the tip ! Is the part number the same for the 83 GL1100 Aspencade ? I’m in the process of restoring a ’78 GL1000. I replaced the timing belts earlier and I’m getting ready to start it up for the first time here soon. I want to double check and make sure that everything is aligned properly. What’s the best way to do this? After a complete overhaul, top end rebuild or timing belt replacement. You should rotate the motor over slowly manually at least 360 degrees. If all is continuous and nothing stops the momentum continue for another rotation. When a few turns have been successful an electric starter can come into play. Slience since 2013. All speak of changing the idler pulleys but no one list a part number. Napa dont have them for something.? We can assist with giving you the OEM part number 14510-371-008 for the idler pulley. There are two required. They can be located by an internet search with that number. hello! Gates belts came saying i need to replace tensioners, idlers and water pump whenever i change the timing belts. Please can anybody clarify this? my bike’s a 1975 GL1000. You can safely ignore that advice from Gates. That was intended for automobiles using the same belt. The idler rollers do need to be inspected and evaluated for proper function. I recently broke a timing belt riding a ’77 through my neighborhood. I was hoping I would have no damage due to it being at a low RPM. I checked compression: cylinders 2 and 4 had 140 and 135 psi while 1 and 3 had zero. Any ideas why both cylinders would have zero? Bent valves I assume?? Any ideas where I can find valves as they are obsolete from Honda?? Yes. You have bent valves on both of those cylinders. Good aftermarket valves are available from many online vendors including Sirius Consolidated. When I first started working on my 1978 GL1000, I knew the timing belt would probably need to be replaced. I went ahead and ordered a belt, but when I removed the cover, the old belt was actually in better condition than the new belt. The new belt I ordered seemed as if it had been around on the shelf for a while (not in bad shape), but the old belt seemed as if it was fresh off the factory line, or close to it. The bike had been stored under a pile of junk in a fully enclosed barn (not much moisture) and many of the rubber and all of the leather components were in perfect condition after cleaning (of course the 29 year old gas was a completely different story in the carbs and fuel tank). What is you opinion on this timing belt? I know by all reason, being probably as old as the bike, it should be replaced. However, I inspected the entire belt. I don’t know if I should replace it with a belt that is not in quite as good condition. Replace both belts. I recommend new NAPA belts (or equivalent) to make sure you are getting fresh stock items. Upon inspection, both tensioner pulleys on my 78 GL have what black marks on them giving the appearance that they have seized and the belts slipped on them???? the right side belt still has the original Honda Belt logo on the od but the left side logo’s are completely rubbed off. I intend to replace both belts but whats up with the idlers? Your input? Carefully inspect the idlers for bearing slop, binding, etc. A fair amount of rubber will “transfer” from the belts to the idlers over time. Whenever there is ANY doubt, I replace the idlers. Adjust the belt tension (cold engine) using the correct procedure (consult the Honda manual), then – RESET the tension again with a warm engine. This prevents over-tensioning the belts which is the leading cause of failed idlers. NAPA has availability on the timing belt, 250274 but it’s listed for an ’80-83 Goldwing item. I have a ’78 1000. They list it as an 87 toothed belt, is this correct? I don’t want to remove mine until I have the new ones in hand. NAPA #250274 is the correct timing belt for all GL1000s.